...is scheduled as the guest speaker for the 254th meeting of the Karl Hess Club, to convene on June 15, 2015. Bob Weber on "What Genetic Testing Tells Us About the History of the Human Race." Bob Weber will examine how a species of hairless apes left Africa, survived disasters and ice ages, and came to populate the world." Bob Weber is one of the Karl Hess Club's most devoted members, having had a perfect attendance most years since 1994 -- and is also one of our most frequent speakers. Bob is a veteran of the freedom movement. In 1964, he cajoled his parents into taking him to Dodger Stadium for Barry Goldwater's campaign speech. He registered to vote as a Libertarian in 1972 and cast a write-in vote for John Hospers. He has run for political office many times, with a perfect record of never having been elected. He served as L.A. County Chair of the LP, was twice the state LP's Southern Vice-Chair, and has served as a member of the state LP's Judicial Committee. He graduated from UCLA with a degree in chemistry, and spent his professional career in motion picture post production. He is a polymath, knowing many things about many things. 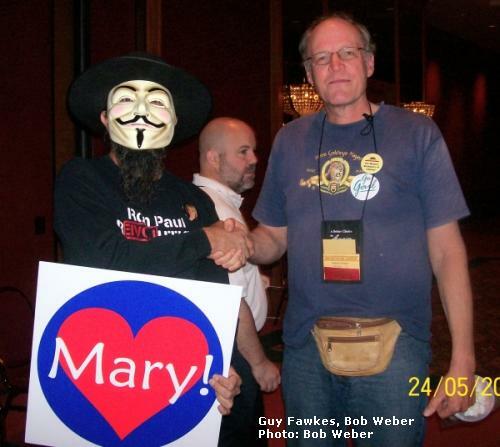 Bob is a recipient of the Samuel Edward Konkin III Memorial Chauntecleer, the KHC's award for Excellence in Agorism.